To manipulate images, I normally use ImageMagick or the GIMP. The former usually on my server web applications, as part of some automation script, and the later covering almost any situation. One feature that makes GIMP much more powerful is its possibility to run scripts, or plugins, written in python or scheme; this is specially interesting to perform repetitive tasks (like in plugins), but also to create programmatically specific images. The main problem using PythonFu is the documentation. This document is probably the best resource, but in most cases, writing an script implies a lot of try an error. Seeing available examples is in my opinion the best help that I have found on PythonFu, and that is the reason why I am including my own basic example in this page (with the hope of extending it later). One more thing: making tasks more complicated, some of the procedures available to PythonFu seem to change continuously. For example, the initial script I wrote, targetting a GIMP 2.6 installation, used the methods pdb.gimp_image_insert_layer and pdb.gimp_image_select_ellipse; running the original script in my current GIMP 2.8 installation complains on those methods, so I had to replace it with the available ones: pdb.gimp_ellipse_select and pdb.gimp_image_add_layer (with different number of arguments!). To start PythonFu, go in GIMP to Filters -> PythonFu -> Console. At some time, not really short, a window will appear showing the python console. The help normally refers to the online documentation, available -for 2.8-, here. A bigger help is available directly on the PythonFu console; the browse button opens the procedure browser, that provides information on the commands available for the script. Now it is just a matter of matching the operation to perform with the right python function. The following script creates the image shown above. 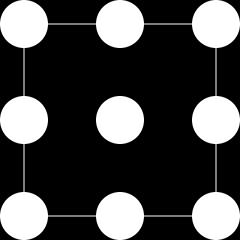 The constant SIZE defines the size of the image, square, as the number of pixels of each side, while the constant RADIO defines the radio of each circle. Here is the full script, conveniently documented. To execute, just paste it on the python console.